“With the addition of these terminals to our network, we are now able to secure a solid position in this market,” notes McInnis CEO Hervé Mallet. The Atlantic province facilities, he adds, join these charter U.S. and Canada distribution points: Providence, R.I., Bronx, N.Y., Oshawa, Ontario, and Sainte-Catherine, Quebec marine terminals plus New Richmond, Quebec railway transshipment station. Toronto-based National Concrete Accessories has appointed Mike Hardman president and chief executive officer. He arrives from Sika Canada, where he spent 30 years, 22 as president. 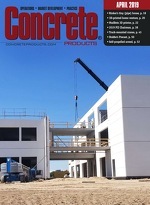 National Concrete has 20 branches across Canada, including a Toronto manufacturing plant, and serves as a one-stop shop for form hardware, accessories, general construction products and supplies. Stoller brings widespread experience in the construction industry, he adds, including hands-on operational involvement, leadership positions in general management, and project management on performance improvement. She gained exposure to ready mixed, concrete pipe, aggregates and asphalt markets in Canada before joining Holcim in Switzerland in a global performance role in concrete. Following the Lafarge Group merger, she was tasked with communications and rolling out key initiatives. Concrete pumping equipment veteran Clint Nichols has joined Liebherr USA Co., Concrete Technology division as Southeast regional sales manager. He will develop and manage sales activities for concrete pumps and mixing technology customers, and create local and regional marketing plans to support the division’s overall strategic goals. He is likewise tasked with overseeing technical integration of Liebherr pumps and mixing technology in the North American market, plus related standards adaptation. Flanked by NYSE President Tom Farley (left) and Huntsman Corp. Chairman Jon Huntsman, Venator President and CEO Simon Turner opens New York Stock Exchange trading on the day of the initial public offering. The Woodlands, Texas-based Huntsman Corp. recently completed an initial public offering of 22.7 million Venator Materials Plc shares, priced in the $20-$22 range and traded on the New York Stock Exchange under the VNTR symbol. The Wynard, United Kingdom-based entity encompasses Davis Colors, Granufin and other Rockwood Pigments brands Huntsman acquired in 2013. With annual sales just over $2 billion, Venator Materials is billed as “a leading global manufacturer and marketer of chemical products that improve the quality of life for downstream consumers and promote a sustainable future. Products comprise a broad range of pigments and additives that bring color and vibrancy to buildings, protect and extend product life.” The company operates Titanium Dioxide and Performance Additives segments, the latter including concrete pigments. Venator Materials serves customers in 110 countries from 27 production facilities; has a worldwide headcount near 4,500; and, will maintain a North American headquarters north of Houston.